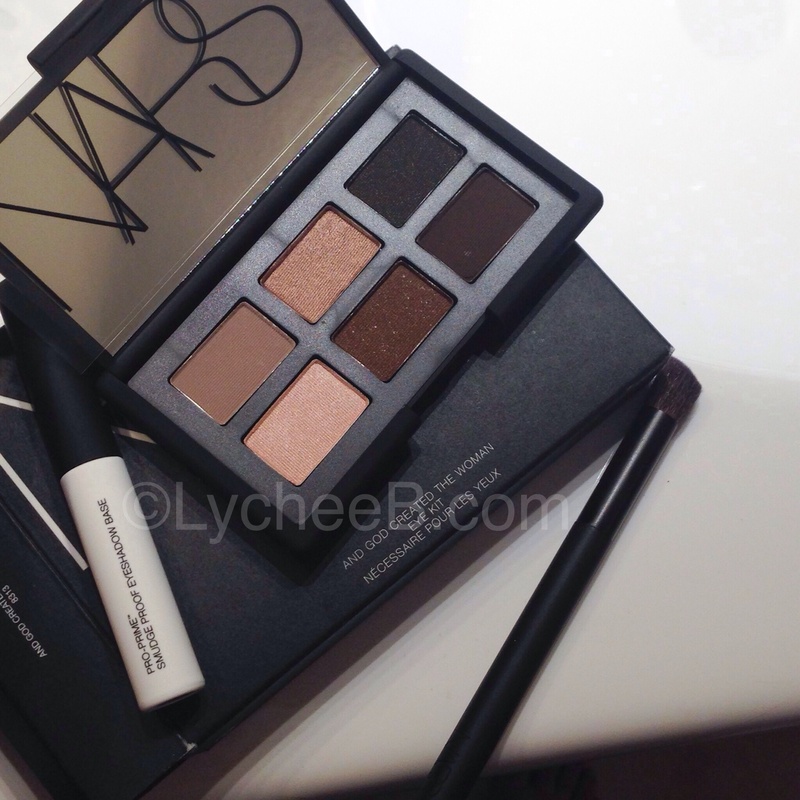 A new palette from Nars, well, a tiny gem indeed. Nars eyeshadows are up there in my list of foolproof formula, so of course any new release from them is a temptation… The concept of the palette is very nice as well, as Nars eye shadows tend to be rather on the pricey side, a little and cheerful palette is a good way of testing out different colors. This eye kit comes with a angled eye shadow brush (N°43), which is good for blending out the shadow or adding matte color to the crease. I wouldn’t risk using it for glitters though, because I did, and I had a ton of gold glitter all around my eyes, yep.. even where I wasn’t supposed to. It also comes with the travel size of the Pro Prime Smudgeproof Eyeshadow base. I have been using the full size for 3 years maybe. It is the best eyeshadow primer I have ever used. You get 2,8 grammes of product which is a good amount, the original is 8 grammes ! It is matte, long lasting, and awesome. Point made. The palette in itself has 6 shades: 2 mattes and 4 shimmery ones. the mattes – Bellisima (the light brown) and Coconut Grove (the reddish toned darker brown) – are a cool tone medium brown shade, good for crease work and a darker brown perfect for smoking it up for night time or special events. The ones with most shimmers are the lighest ones, Alahambra (the light pink) and Kalahari (the darker gold one), good for applying all over the lids. Kalahari is just gorgeous as it is. The last two ones, dark with slight gold shimmers, Night Clubbing (the black one) and Galapagos (the dark brown one) are gorgeous yet the scariest to use for an easy everyday look. Clearly out of my comfort zone. Be careful when applying the darker shimmery shades as there is a bit of fall out the brush you use has long and loose bristles. Using a small or flat powder brush or your fingers is best! As of the quality of the shadows, as always with Nars, it is on point! buttery and pigmented. This palette is beautiful and help enhancing the Woman natural beauty. It retails for 45 Euros in Sephora.